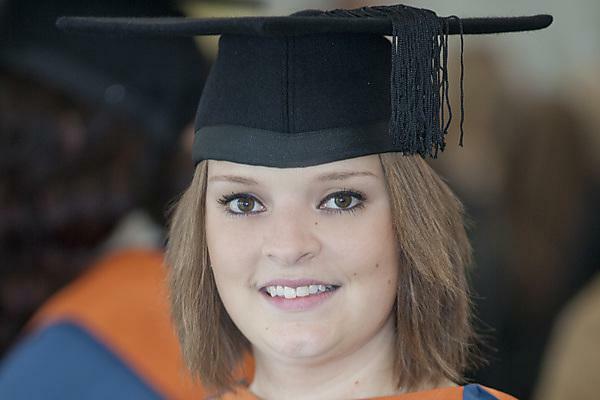 “Embarking on my degree at Plymouth should have been the beginning of an exciting new chapter for me, but my mum had just been diagnosed with lung cancer. Then, in January 2010, I started having severe headaches, which GPs thought were migraines. As the headaches became worse, I saw a total of 11 medical professionals, including GPs, A&E doctors and opticians, who diagnosed me with a variety of things, such as sinus problems. After a long wait and fed up with no-one taking me seriously, I rang Derriford Hospital in Plymouth and begged for help. I was given an emergency MRI scan that revealed I had a brain tumour. Straight away I had an operation to insert a shunt into my brain to drain the fluid which had been causing the pressure and excruciating pain. Then came a seven-and-a-half-hour craniotomy to remove the tumour. The news that it was cancerous – a grade 4 medulloblastoma – was devastating, and I was shocked to learn that without the surgery at that time, I would have died. To give me the best chance of beating the cancer, I immediately underwent six bouts of chemotherapy – one cycle every two weeks, followed by radiotherapy twice a day for five weeks and then a year of maintenance chemo. The chemo made me feel very anxious and it was tough losing my hair. I also had to miss the whole second term of my studies, so I don’t know what I’d have done without the love and support of my family and friends. It was during the chemo and radiotherapy that my dear mum passed away. This was such an awful time, particularly as my illness had robbed me of the chance to spend much time with her. After she died, my health deteriorated, although thankfully I did make it to her funeral. It was just a couple of months later that things finally looked up and a scan showed no trace of the tumour. I was elated, and all my subsequent scans have been clear. I was able to complete my studies, and was really proud to graduate in 2013.